One of the ways we measure our success as a public space is the pervasiveness of the words "Bryant Park" in our midtown neighborhood. The idea of having world-class office buildings, big name retailers, and a luxury hotel naming themselves after the park would have been unthinkable just decades ago, when "Bryant Park" brought to mind drugs and danger, rather than an urban oasis. 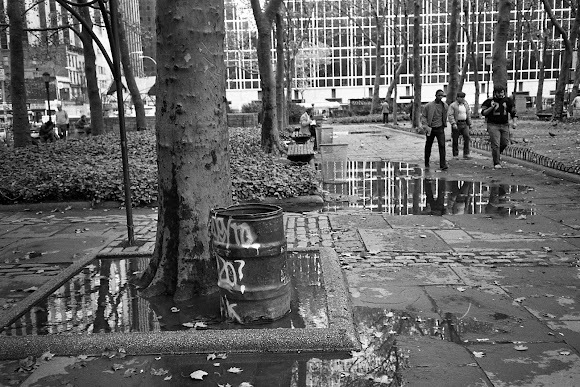 Bryant Park of the early 1980s. Once the Bryant Park Restoration Corporation was founded in 1988, the park's reputation began to change. The cleaner, safer, and more vibrant Bryant Park was no longer a neighborhood liability. People who lived and worked around the park were able to take advantage of its greenery, free programs, and pleasant atmosphere, and the park gradually became an asset to the neighborhood. A 2015 Wall Street Journal article found that rents around Bryant Park were, on average, 12.5% higher than similar buildings in neighboring areas. The Bryant Park Hotel, in the former American Radiator building, was named in 1998 and opened in 2001. The idea of a luxury hotel not only located on the park, but actually naming itself after the park, would have been unthinkable when the park and neighborhood were both in disrepair. The Bryant Park Hotel is in the striking black building on the 40th Street side of the park. The Bryant Park name was taken up by many businesses and buildings in the years that followed. One Bryant Park, also known as the Bank of America Tower, opened in 2008, and kicked off a series of Bryant Park vanity address conversions: 1095 Avenue of the Americas became Three Bryant Park, and 1065 Avenue of the Americas became Five Bryant Park. The most recent office building in the area, whose architecture seems to salute the park, opened in 2015 as Seven Bryant Park. Our soon-to-be-newest neighbor, a residential tower being constructed on the south side of 40th Street, will be known as The Bryant. Three Bryant Park (left) and One Bryant Park keep watch over the Film Fest. Retailers around the park have followed a similar pattern. Chains like Blink Fitness, Soulcycle and Equinox have recently moved into spaces near the park, and, while they could have just as easily named themselves Blink Midtown East or Soulcycle Times Square, they chose to be known as Bryant Park instead. It's notable, too, that not all these stores have frontage on the park or even views of the park. 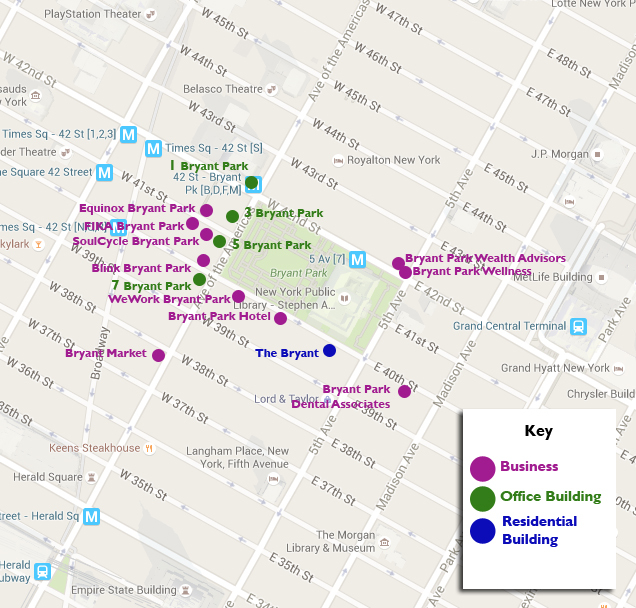 This map shows a sampling of businesses near Bryant Park that have taken on the park's name. Recently, we've noticed another trend. As Times Square makes headlines for its crowds and characters, Bryant Park's proximity has become a marketing tool for buildings that are located in Times Square. 4 Times Square, former home of Condé Nast, recently re-branded to 4 Times Square at Bryant Park. 3 Times Square features a photo of Bryant Park on its leasing website, and 7 Times Square describes itself as "steps from...Bryant Park." Formerly 4 Times Square, newly "at Bryant Park." The only possible downside to this flattering naming trend? Our receptionist receives a number of calls from people trying to reach other businesses with the Bryant Park name. But as long as it means our neighbors are excited to be nearby, keep the calls coming. We'll see you in the park soon.